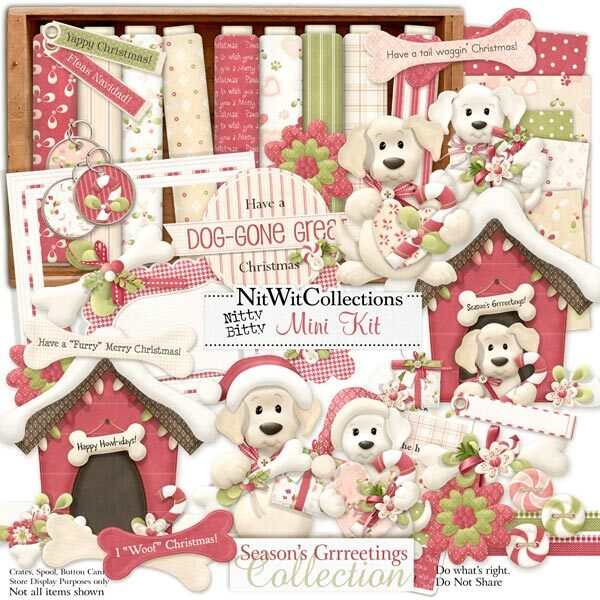 Nitty Bitty "Season's Grrreetings" Mini Kit is a great Christmas mini kit for those of us with puppy pals! We KNOW that they are certainly included in all of our Christmas celebrations, so I thought it only appropriate to give them their own mini kit as well. This Nitty Bitty Mini Kit also coordinates with our FQB "Heart of Christmas" Collection and add on products, so feel free to have a look at those for extra elements and papers to use with this Mini Kit. 3 Button Mints - the pups sometimes need a breath mint, don't they? 1 Doghouse without the pup - sometimes the only way to get a photo, hey?? 1 Poinsettia - sometimes poisonous to the dogs, so I've limited them! 3 Puppy tags with 2 ready for your pup's name perhaps? 1 Wordart - "Have a Dog-gone Great Christmas"